New year, new opportunities. We took advantage of CES 2016 to announce that the Alliance is expanding into a new sector – the Automotive sector. Wait, wait, wait – what was that? Yep – you’ve read it right. You see, our cars are becoming an extension of our day-to-day lives. However, when we get into our cars, and we connect our smartphones, program our GPS, back up or maneuver with the aid of inbuilt cameras in the car, we don’t necessarily think of the underlying infrastructure necessary to make sure all these things work as necessary. Turns out that the same infrastructure that brings the benefits we value in the AV world – uncompressed transmission of high-throughput video, near-zero latency, simple cabling and installation, long distances – can bring all of these advantages to the automotive environment. Right now, car manufacturers and suppliers have a few challenges to provide us – consumers – with what we expect: how to accommodate ever-growing bandwidth needs (whether from infotainment – such as movies, GPS, apps – or from ADAS, or Advanced Driver Assistance Systems, which help increase our driving safety); how to do so over a simple, low-cost, light cable; and how to connect – or network – all such domains in the car for a smooth, more effective operation. All this can be achieved with HDBaseT – a technology that provides the fastest, most reliable infrastructure for in-vehicle connectivity on a low-cost, simple cable. HDBaseT has proved itself in the consumer electronics environment. Today, our cars are just an extension of the CE world. HDBaseT Automotive – a derivative of the HDBaseT we all know and came to love – allows for the transmission of up to 6Gbps over 15 meters of a single pair, unshielded cable (UTP), with close-to-zero latencies, while simplifying native networking and multistreaming. HDBaseT combine the best features of competing technologies into one, standardized technology. Just as in 2010, when the Alliance was created with the support of LG Electronics, Samsung Electronics, Sony Pictures Entertainment, and Valens, we enter the automotive sector with leading players in the market, including General Motors, Daimler and Delphi. 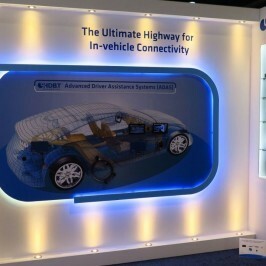 HDBaseT is the ultimate highway for in-vehicle connectivity. Why don’t you join us for the ride?